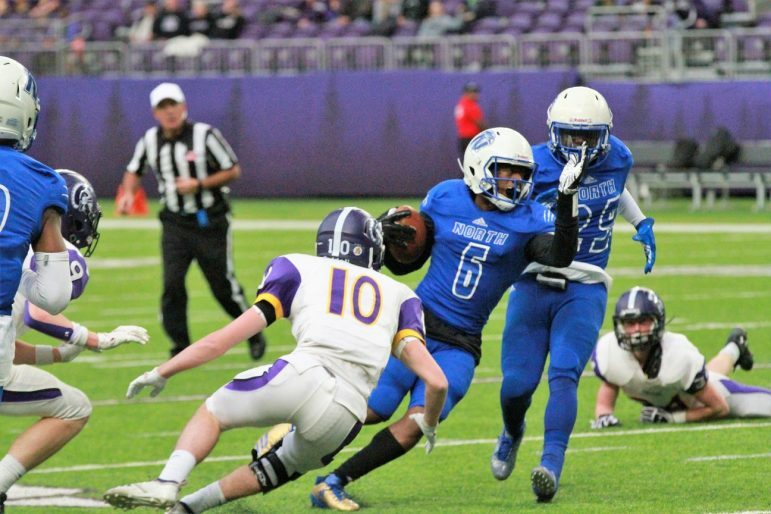 State tournament appearances are becoming a tradition for Minneapolis North — in football. The Polars, routinely known for having one of the state’s top basketball programs in the state, recently made their fifth consecutive appearance in the state playoffs in Class AA. (They were in Class A during 2014, 2015 and 2016, the year they won the title). Under the direction of Head Coach Charles Adams, the Polars were one of the state’s most dominant teams, recording six shutouts while compiling an 11-1 record and reaching the semifinals. Here are some of the talented players who led North to yet another memorable season. Sophomore quarterback Zach Yeager passed for 1,175 yards and 15 touchdowns. Senior running back Keyhan Porter rushed for 787 yards and 15 touchdowns, receivers Omar Brown (four touchdowns) and Nasir El-Amin (five touchdowns) averaged 18.8 yards and 11 yards per carry respectively, while Taqiuris Wair had an 11.6 yards-per-carry average and three scores. El-Amin led the way with 452 yards receiving, 16.1 yards per catch, and six touchdowns. Brown added 389 yards, averaging 22.9 yards per catch and scoring five times. Eli Campbell averaged 13.8 yards per catch with two scores, and Daniel Crandall averaged 12.6 yards while also scoring twice. Linebackers Porter, Wair, and JaRon Ross-Hawkins; linemen Quentrail Travis, Jeremiah Stewart Izaiah Yeager, and Davant Moore; and defensive backs Dominick McMillan and Crandall all recorded no less than 20 tackles during an undefeated regular season. With Zach Yeager returning at quarterback along with the entire offensive line, Adams was very optimistic when questioned about this team’s future.